For the tough, weather-beaten farmers in the rural heartland of West Bengal, agroforestry is an age-old tradition that even finds mention in their folklore. In the remote village of Bhattadighi, a group of women farmers observes a unique ritual, known as Paakh Pakhali or “welcoming birds,” in which they fill an earthen urn with water and top it with mango leaves and green coconut. Placed under a freshly planted neem tree sapling, it symbolizes the goddess of farming, Bhumi Lakshmi, whose mythical mount is a barn owl. The holy site is adorned with facsimiles of owls, painted storks, herons, egrets and other birds, all painted on white terracotta plates. “Our paddy plants are set to bloom within the next few days. We pray to the Goddess not just for a bountiful harvest, but also to send many owls and birds [to] our fields, to eat away the insects and rats,” says Malati Burman. The neem tree (Azadirachta indica) is also revered by the farmers during the festival for its strong pest-repellant properties. “The bitter leaves of the plant are added to our locally prepared insecticide and its branches are perfect for birds,” Burman says. For the farmers of this village within the Raiganj block of North Dinajpur district, paddy cultivation is not about modern industrialized monoculture farming, but developing multi-crop diversity. Here, miles of tender rice plant seedlings stretch out amid a maze of sprawling trees, shrubs and vines that conjure the appearance of a forest: Dhaan Bagan, or paddy garden, as locals call it. But the trees aren’t there just as scenic dressing. “With forest covers dwindling and giving way to agricultural lands, such landscapes can largely compensate for environmental loss and mitigate climate change impacts,” says Om Prakash Chaturvedi, director of the Central Agroforestry Research Institute. Trees also help retain moisture in the soil and put a check on erosion from storms and gales, he says. India has set a high target for increasing its tree cover from the present 24 percent to 33 percent of its total area, primarily by promoting agroforestry in croplands, says Chaturvedi. Some 174,500 square kilometers (67,375 square miles) of land in India is cultivated through agroforestry, according to the latest remote sensing data from the Central Agroforestry Research Institute. 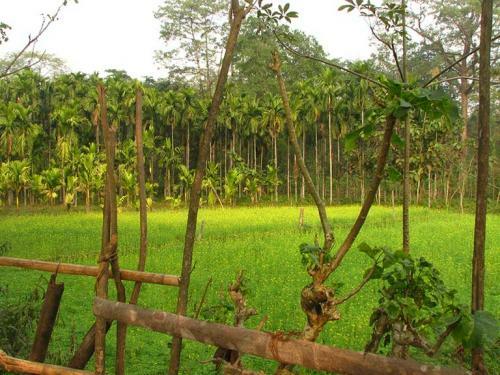 In West Bengal alone, agroforestry is practiced across 1,800 square kilometers (695 square miles) of the state, according to Pratap Kumar Dhara of the Bidhan Chandra Agricultural University. Biodiversity also flourishes in these diverse croplands. In West Bengal in October, golden yellow butterflies could be seen, while a fork-tailed black drongo bird (Dicrurus macrocercus) made its presence felt with raucous calls from atop miniature scaffolds supporting gourd vines. Nearby, egrets strutted around the watery fields, occasionally popping their heads in and out of the paddy seedlings, the young rice plants that haven’t sprouted grain yet, as a group of black-and-white myna birds hopped merrily on Sesbania pea plants. Edging the fields were trees like papaya, mango and banana, which provide nesting sites for migratory avian guests from the nearby Kulik Bird Sanctuary — Asian openbill storks (Anastomus oscitans), cormorants, herons and egrets, which also forage in the ponds. “Birds, insects and butterflies seem to love our fields as there is no trace of chemical fertilizers or pesticides in them. Our paddy is of indigenous, folk variety,” says Chinmoy Das, a farmer from Hatia village in North Dinajpur. The trees and shrubs planted in and around the fields form an essential ecosystem developed with the right mix of multi-utility plants that also provide excellent perches for predatory birds, Das says. “Our paddy ecosystem harbors varied birds such as kingfishers, storks, little green bee-eaters [Merops orientalis] and insects [such] as spiders, dragonfly and damselfly, which control grain-eating pests and aphids,” says Shourin Chatterjee, from Abhirampur village in Bardhaman district. Like Das, more than 1,000 farmers from across 11 districts of West Bengal have taken to organic cultivation of folk rice varieties (FRVs), spread over more than 1,180 square kilometers (456 square miles) of land, says Anupam Paul, director of the Agricultural Training Centre (ATC) at the West Bengal Agriculture Department. Unlike modern, high-yielding varieties of rice, FRVs can to a great extent withstand weather aberrations due to climate change, while also cutting down on costs. Paul has helped revive more than 420 indigenous varieties of rice from the brink of extinction, with nearly 300 varieties of FRVs now grown by farmers across the state. These include 40 strains of aromatic and red rice each, 25 kinds of fine paddy, 10 high-yielding indigenous types, and 12 deep-water paddy varieties, among others. “The success story of folk rice cultivation is, however, incomplete without our agroforestry practices,” says Das, noting the importance of having a tiered system of planting with trees that block winds while letting sunshine through to the paddy seedlings. On his 5.7 hectares (14 acres) of land in Hatia village, Das displayed his four-tiered “paddy forests.” The first level includes pulses (peas, beans or lentils), carrots, potatoes, various kinds of spinach, tomatoes, onions and garlic, all of which grow to a maximum height of 60 centimeters (2 feet). The second tier includes bay leaf, turmeric, ginger, eggplant, mustard and vining vegetables that reach a maximum height of 1.5 meters (5 feet). The next step has taller plants growing above 1.8 meters (6 feet), such as Sesbania peas, maize, bamboo, bananas, papayas and sugarcane. Towering timber trees like mahogany and teak grow beside older mango, jackfruit, neem, drumstick (Moringa oleifera) and full-grown bamboo, making up the fourth tier. Das says such plantings are ideally grown on the western and northern side of croplands because hot and dry afternoon winds from the west reduce soil moisture and increase the rate of evapotranspiration from the plants. “Our plantings, while obstructing such winds, enable the paddy to enjoy ample sunshine for its growth,” he says. Other plants are interspersed among the paddy seedlings, says Gaurav Mandal, a farmer from Bamongola village in Malda district. Shrubs and vegetable-bearing vines on his 1.5 hectares (3.6 acres) are perched on mini scaffolds between rows of paddy. These scaffolds, initially erected with dry bamboo, are gradually replaced with grafts of such multi-utility trees as agati (Sesbania grandiflora) and betel nut (Areca catechu). This way, vegetable vines are then supported on the growing trees’ trunks. To achieve a sustainable rice yield, local farmers make their own organic fertilizers. Madanmohan Aich, from Dewanhat village in Cooch Behar district, recounts the recipe for his liquid organic manure: soil, preferably from his agroforest; leaves from at least five pest-repellant plants he grows, such as custard apple (Annona reticulata) and neem; plus cow manure and more. Leguminous plants as Sesbania peas, pulses and azolla are thrown in to maintain the natural health of the soil. Sesbania seedlings are planted at a regular distance of 60 to 90 centimeters (2 to 3 feet) from each other across the field, and 30 to 45 centimeters (1 to 1.5 feet) away from paddy seedlings. They can withstand waterlogged soil, growing rapidly, and their leaves form an excellent green compost that enriches the soil. They also serve as a “catch crop” whose bright yellow flowers attract insect pests away from the paddy plants. Quick stick (Gliricidia sepium) is another effective nitrogen-fixing tree grown here. Pest-repellant trees such as Chinese chastetree (Vitex negundo) and neem are also a part of Aich’s paddy forest. Banana trees, meanwhile, help enrich the soil with their succulent stem parts and fruit peels. These multi-layered agroforests are storehouses of many varieties of fruit and vegetable that can be sold. Chinmoy Das says he grows at least 36 types of brinjaleggplant along the edge of his paddy field, as well as eight types of okra and more than six varieties of pulses and even cherries. All of these provide food security and nutrition for his family, with the surplus sold at the market to supplement their income. Many of the trees grown in these agroforests provide firewood, livestock fodder and timber. Lumber from the rain tree (Albizia saman), for example, is used as a substitute for more expensive woods for building and household purposes. The bounty grown here also has medicinal benefits. The leaves of Sesbania, rubbed on a fresh wound, help clot blood, says Shantirani Burman, a farmer from Hatia village. Water clover (Marsilea quadrifolia), which abounds in the fields, is not only tasty and rich in beta-carotene, calcium, iron and phosphorus, but is also used to treat bone disorders, eye ailments, anemia and more, Burman says. Kadam (Neolamarckia cadamba) leaves provide snakebite anti-venom and are also useful for treating worms. Both of these latter ailments are common in the villages. In Pratappur village, Bardhaman district, the farmers also practice aquaculture in their paddy ponds, where they grow FRVs that require at least 1.8 meters (6 feet) of standing water. Enterprising farmers like Abhro Chakroborty make the most of the ponds to cultivate catfish. His 200 square meters of land, about 2,200 square feet, yields 60 kilograms (132 pounds) of paddy and almost as much catfish, he says. Edible crabs, mollusks and carp have also been introduced into these ponds, amid the floating edible water spinach (Ipomoea aquatica) and the useful and sturdy mat grass (Cyperus tegetum Roxb.). Another interesting diversification is led by tribal women from Gangarampur block in South Dinajpur district, who are now cultivating mushrooms on paddy and wheat straw. Motivated by such agroforestry success stories, nearly 100 women and men from at least 20 villages have established the Forum for Indigenous Agricultural Movement (FIAM). Aimed at spreading organic farming and promoting the conservation of indigenous paddy, fruits and vegetables, its membership is fast increasing with young people, too. “The Green Revolution of the 1960s that led to cultivation of modern high-yielding varieties of paddy [compelled] our farmers to go for mono-cropping,” says Partha Das, 22, an English honors graduate from Palaibari village in North Dinajpur. This required the extensive use of pesticides and chemical fertilizers, Das says, adding he was shocked by incidents of farmer suicide across the country as a result of debt from the rising cost of fertilizers, insecticides and seeds. At FIAM, he is joined by the likes of Anima Mandal, who, at 83, has also witnessed these changes and more, and now envisions an organic future. “Our forefathers practiced organic, low-cost, intensive and healthy farming,” agreed Bablu Barman from Bhattadighi village, another passionate organic farmer. “We believe this is sustainable and here to stay.” Healthy eating is the order of the day, he adds, and there is a growing demand for organically grown farm produce in the big cities. Given all of the environmental and social trends and challenges, agroforestry looks set to help deliver on that growing demand in this part of India. The article was first published in Mongabay.